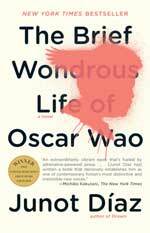 Richard Fox, Head of the Popular Library at CPL, is back once again, this time to lead a discussion on the winner of the 2008 Pulitzer Prize for Fiction --The Brief Wondrous Life of Oscar Wao by Dominican-American writer Junot Díaz. Díaz has spun the heartbreak and loneliness of the immigrant experience into literary gold with memorable stories of marginalized outsiders caught between two cultures, never completely fitting into either one. This is the long-awaited-and thrillingly satisfying, genuinely original-first novel from the unmistakable voice behind the story collection, Drown. Things have never been easy for Oscar, a sweet but disastrously overweight, lovesick Dominican ghetto nerd. From his home in New Jersey, where he lives with his old-world mother and rebellious sister, Oscar dreams of becoming the Dominican J. R. R. Tolkien and, most of all, of finding love. But he may never get what he wants, thanks to the Fukú americanus--the curse that has haunted the Oscar's family for generations, dooming them to prison, torture, tragic accidents, and, above all, ill-starred love. Oscar, still waiting for his first kiss, is just its most recent victim. Posted 2008-10-07 15:47:38 by Barbara_Loomis.